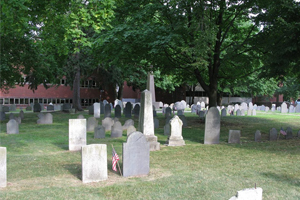 The Salem Street Burying Ground is a cemetery located at the intersection of Salem Street, River Street, and Riverside Avenue in Medford, Massachusetts. The grounds were used exclusively from the late 17th century to the late 19th century for the burial of the town's civic ancestors. It began as a private burial plot owned by the Wade family. The earliest marker dates to 1683 and the last dated around 1930. Aside from marked burials, there are likely numerous unmarked sites including a large section which is believed to contain fifty slaves. Our Eternal Treasure was a yearlong celebration to raise awareness for this recently restored landmark. Walking tours, lectures and even a theatrical performance brought history to life for residents. They connected with their civic ancestors and gave this National Register site the light it deserved. Performed in collaboration with Dee Morris of the History Connection. 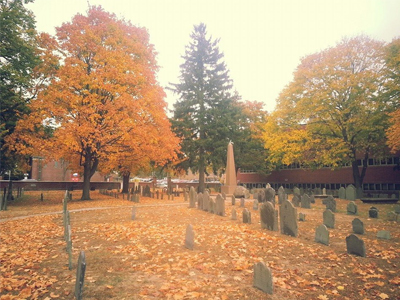 About the Salem Street Burying Ground: Click here for more information about the Salem Street Burying Grounds. Event SponsorsThis program was sponsored by a generous grant by the Massachusetts Cultural Council through the Medford Arts Council. Learn more about how we celebrate your community's past and find out more about this year's project. Attend one of our numerous lectures, walking tours or living history events across New England. Come read our blog, or find us on Facebook and twitter. We love to hear from you. From house history aids to recipies for tasting the past, we have the right resources to help you. © The Preservation Collaborative, Inc. 2011-2014. All right reserved.